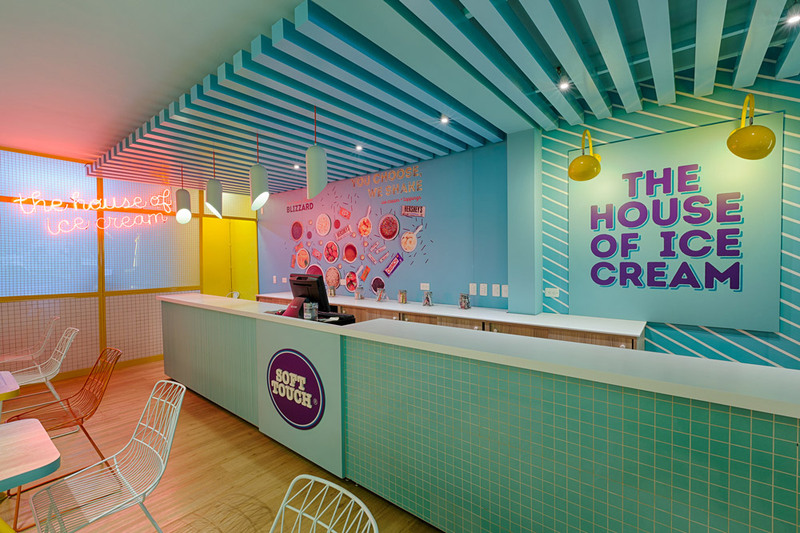 The idea of being tasked with redesigning an ice cream shop that you used to visit for years can be quite thrilling in a very nostalgic sense. Reimagining the space you frequented and associated with the sweet joy that comes from enjoying ice cream, is a precious honor. The Plasma Nodo company of graphic design were given such an honor by the owners of Soft Touch, seeking to refurbish their brand yet preserve the sentiment integral to their establishment’s narrative. The Plasma Nodo team embarked on their design journey by simply submerging themselves in Soft Touch’s essence. They spent time at the ice cream shop to tap into an emotional reserve that would lay groundwork for an innovating restoration. Chatting with customers, employees and employers helped the research process as well as visiting other retail locations. The design team set their sights on particular details of Soft Touch’s product and ideology. Focus was placed on finding textures, colors, and shapes that were unique to the brand along with any visual context that presented itself. With these tools, Plasma Nodo set out to create their stunning rendition for Soft Touch. The end result was nothing short of immaculate. 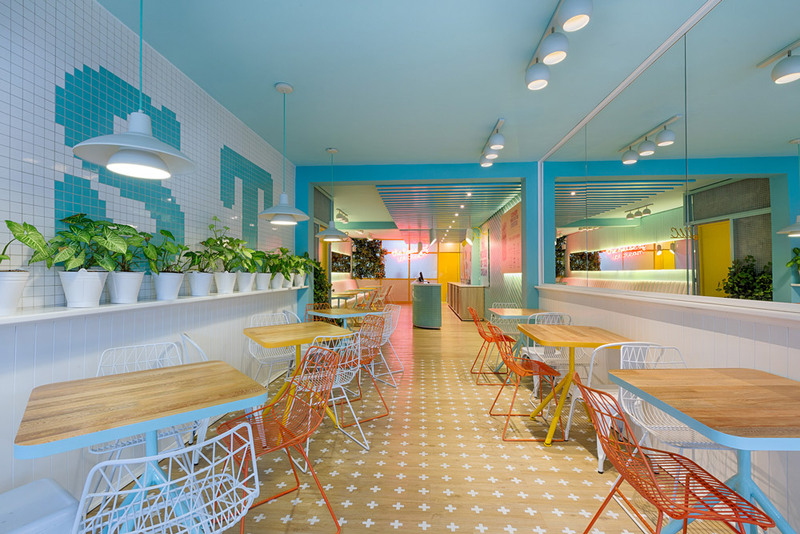 Plasma Nodo achieved a revamped space that held true to the values of Soft Touch while emulating a fresh and modern take on the traditional ice cream shop design. The color scheme features many complementing pastel colors mixed with neutrals and some starker hues. 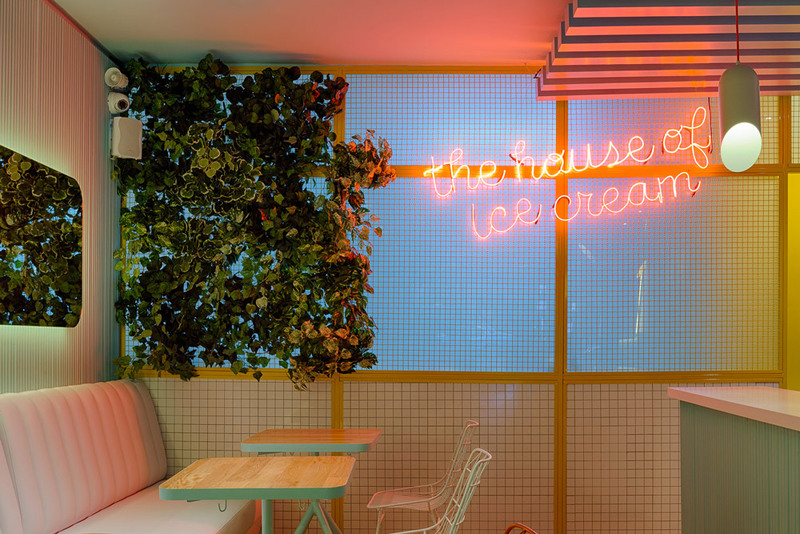 A neon sign that says “The house of ice cream” casts a pink glow that instills a feeling of impending joy accompanying the delicious experience to be had. An extensive countertop and half booth seating calls back to the more traditional arrangement of the ice cream shop. A glossy tile wall with the initials “ST” marks the quaint business. An elongated mirror, backlit with a soft fluorescent light, parallels the countertop area to reflect the stylish space. It is a whimsical touch that calls the attention of the viewer to appreciate Plasma Nodo’s excellent design. Other materials used to create this artistic feat included things like oak, metallic mesh, glass, ceramics, and concrete. It is no surprise that Plasma Nodo’s work with Soft Touch’s shop in Medellin, Colombia was received with high praise and recognition. Their success has allowed them to continue on to taking on new models of retail in the Laureles region of Medellin. New openings among other projects are highly anticipated events to be expected from Plasma Nodo and their partnership with Soft Touch.